Health and safety was a big concern for me when planning for this trip. As any of my friends and family will tell you, I don’t have the best reputation for cycling proficiency. I was in two pretty major accidents last year; one resulting in a broken arm (and pretty bruised up body) and two resulting in a helicopter life flight (the life flight was overkill and thank goodness from this accident I only suffered a bruised up body and spirit). As a result of these accidents I wanted to take precautions. We have taken out insurance for this trip, although based on research and cost we are only taking out insurance for a few months at a time, that way you can cover the part of the world that you are in and not try to pay for cover of all countries at once. There are some really good options for cycle touring cover out there, for Europe for 3 months we used insureandgo.com. You can book this insurance online, it is relatively inexpensive (about £85 for both of us for 3 months) and it covers cycle touring for the whole of Europe. My other advise would be to obviously where a helmet whenever you are on the bike! And get reflective clothing and good lights. We brought the following in our first aid kit. Sunscreen – I wear it every day! I am a 33 year old American (West Virginia girl to be precise) who has lived in London for the last 13 years. 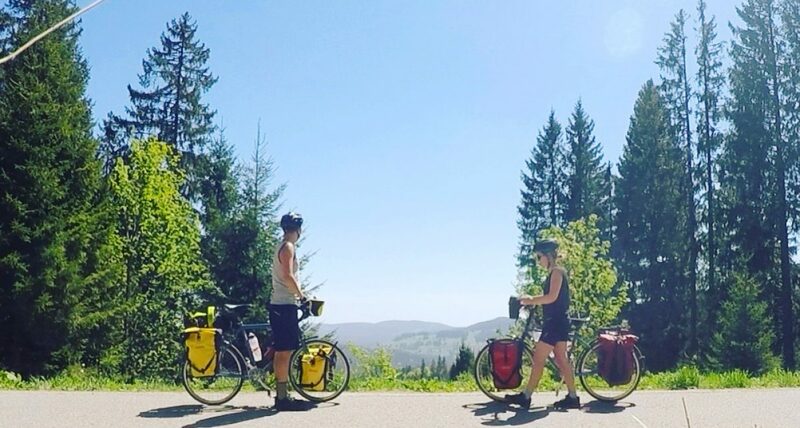 After 10 years of working in marketing, (and commuting two hours each way every day into work) my husband and I decided it was ‘Now or Never’ and we have left on our cycle touring adventure of world. First stop Istanbul! Although I have given up a lot to live out of 4 pannier bags, I still want to do this tour my way. This blog is hopefully gives you an idea of how I have achieved that. My Travel Diary Create a free website or blog at WordPress.com.